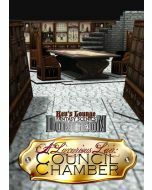 These cutfiles are for the "A Luxurious Lair: Council Chamber" Dungeon playset by Kev's Lounge. These cutfiles are for the "A Luxurious Lair: Council Chamber" Dungeon playset by Kev's Lounge. They were created with Silhouette Studio version 2.7.18 by Kevin Richard John Berry and OldSchoolDM @ the Cardboard Warriors forums.